Interested to know how is 2015 going to be for you. See below what Tarot says for your Sun Sign in 2015. Finally I got the YouTube video of the Television show I did on local Telugu channel ABN Andhra Jyothi. Since this was a live show of 1 hour, the video is long and divided into 3 parts. 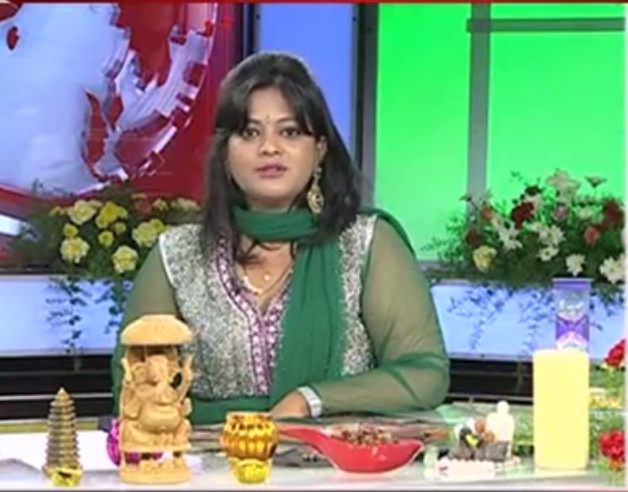 I did the predictions in English and the host translated it to Telugu language. This time I also covered all the important areas of one’s life like Health, Career, Relationships and Cosmic advise by angels. I also suggested remedies where needed and my mom helped me in adding recommended colors for each Sun Sign. You may checkout my last years i.e. 2014 predictions here, and let me know how true were they for you!! Post your feedback in comments below. Currently we are also running an offer – Get 2015 Tarot + Astrology + Angelic prediction is Rs 2015/- only. What are you waiting for contact us for your personalized reading for 2015 in Rs 2015 now! Contact us or send an email @ shubhrajain86@gmail.com. Check out all our services here and what other are saying about us in testimonials. Follow us on facebook and twitter for latest updates. YAY! Its a hat trick me on TV again and this time LIVE!! This time Mr Shade from ABN Andhra Jyothi Channel contacted me for doing a 2015 Tarot forecast show. He asked me that would I be comfortable doing it LIVE show this time and taking callers queries on the show. I was very excited and confident, only concerned about the schedule as 31st Dec is my husbands birthday and I had planned many things. Good thing was I wasn’t travelling out of Hyderabad this time for new year celebrations. On 31st evening 2 pm, the format of the show was finalized over the phone. Since the show would be live, I had to provide some points of predictions in advance so that they could be displayed on the show in Telegu. It was quite pressing for time as I had a movie planned at 4:30 pm – “PK”, followed by new year party 31/12 at N Convention. Immediately I invoked Angels for guidance and called my mom. My mom suggested we combine Tarot and Astrology and we both discussed and did readings for all signs with respect to Tarot Cards, Angel Cards and Astrology for more than 2 hours. We recorded the discussions but the hardest part was to write the transcript. The interesting part was even my family was going for same movie in Delhi around same time. Me and my sis with help of multi-tasking ingrained in our family and with the power of android phones in our hand, wrote transcript for each Sun Sign listening to the recording and exchanging emails, all this while getting ready, rushing to theater, watching the movie, during intervals , rushing for new year party and eventually partying 🙂. Each Sun Sign prediction was first written and then sent to my mom for review, after approval and correction was sent to the show director. We could finish all not before 1 am on 1st Jan 2015. We came back from the party around 2:30 am and slept off exhausted. On 1st it was next to impossible to get up and get ready as we had body aches, that what happens if you dance after a long time. We got up at 7 am and I was trying to remind myself the struggle of each actor to look good the next morning and motivating myself too 😉. My husband helped me select my dress and pack my props. 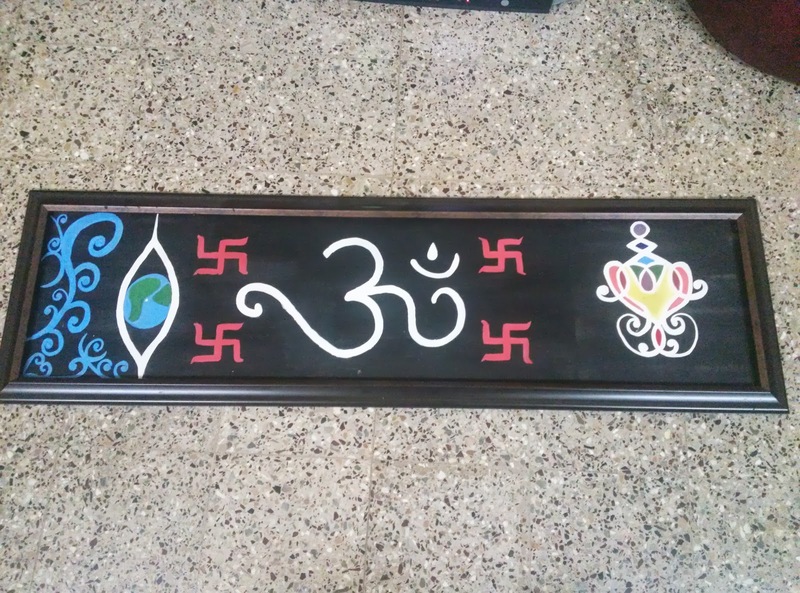 This time I carried two main new things, one was Ganesh idol which I had received as a marriage gift and another was my crystal angels figurines. We reached on time and were ready for the show by 10 am. The program went well with a lot of impromptu discussion with the anchor about what is Tarot ?, how Tarot card readings are done etc. I also explained a bit about Angel and Tarot Reading, Angel Cards and affirmations. 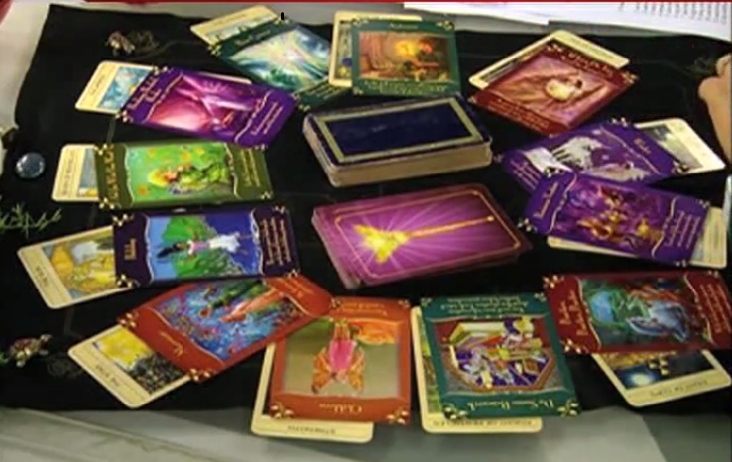 On the show I used “The Mythic Tarot Cards” and “Magical messages from Fairies Angel Oracle Cards” using a 12 card spread. I also did 2015 predictions for political figures like Mr Narendra Modi , Mr Chandrababu Naidu and Mr KCR followed by predictions for Indian Cricket team and Obama Visit to India. I could not have done this without my family support. My mom with her amazing knowledge explained the movements of Saturn this year in each and every Zodiac Sun Sign so easily. Then my sister for her efforts and last my husband for his patience and support, not getting upset about me working when we were supposed to be partying. I will be sharing the YouTube video of the show and also detailed prediction of each Sun Sign tonight. Yes it would be third long night in a row but I am loving it! July 2013 Saturn position changed and brought many upheavals in my life. My negotiations started to change in last discussion stages, got me hospitalised, so many financial shocks and what not! :-). Its like knowing the bull will hit you, you are expecting and anticipating the hit, but until you are hit you do not know how bad is it. Its still under progress as you can see. When I shared the same with my dear friend, who was not able to control himself to criticize it and inspite of me trying to act not react things became sour. So on Sunday I evening after my classes I went to Hyderabad lake- Hussain Sagar, had some “Me” time, updated on Facebook “Cherishing bhutta and drizzle at Hussain Sagar, alone and not missing anyone”. Now how is that related to falling sick and getting hospitalised? I missed mentioning “Ice- cream“. My parents were pretty protective about me having street food and ice-creams during rains, and I thought I am single independent upset women I can do what I want and have ice cream. Violla – woke up the next day ( Monday 8th July ) with high fever, sore throat and back pain. Immediately took out my self medication weapons to fight it, hot water with salt gargles, Vitamin C and long sleep which got converted to deep sleep. No I was not in trance, I couldn’t get up from the bed due to weakness. I endured it for another day and Tuesday evening went to the hospital with a friend and crashed. As mentioned July 2013 is all about resolving childhood issues and I have a bad sleep-awake cycle, which I proudly announce as being “nocturnal”, that just the way I am. I can easily stay awake the whole night, and that is what I have done past 1 month. I love the silence at night, the noise of the fan, sound of the ticking clock, and the howling of the street dog; perfect setup to study. But unfortunately it doesn’t sync with Nature and I have to change it. Change willingly than wait for a Saturn’s whip to change you! Look into your life and notice any such similar experiences this month. Do share with us and check if you need any remedies to resolve them. Whenever anything bad happens in my family everyone starts questioning and pestering my Mom ” Did you see this coming?” Did you know this would be so bad?”. Recently when I was suffering from high fever, dehydration, throat infection and taken in for hospitalization my mom was so tensed. When I spoke to her I said Saturn changed on 8th July and its here to break some more patterns, high fever is better than something severe, and my mom smiled ( I could see that over the phone too :p ) and signed. I loved a comment by one of her friend – “Lucky man, her life is so easy she can foresee things and plan everything accordingly” ! Is it?? Yes, we do foresee and sense things beforehand which can help to plan things but if you start doing that always then wouldn’t your life be more calculative? Where would be the fun? Fun is in getting surprised by the life and embracing it. And the Power is the strength of doing that continuously. I do not have super powers, the power I do have is the understanding and acceptance of The Super Power and how it is omnipresent and available to all of us to harness. The belief in the will power and how we all can manifest our desires and create our life. This is what I believe in and this is what I try to share with everybody. Watch out for my next post where I share the nasty details of what exactly happened and how hospitals can help you heal even when you are surrounded by gazillions bacterias and sad faces!